It’s that passion, and a desire to help people through problem-solving and design, that has drawn Ajen to civil engineering. And that in turn has led the 20-year-old to Plymouth, home to some of the most iconic civil engineering monuments, such as Smeaton’s Lighthouse and Brunel’s bridge spanning the River Tamar. 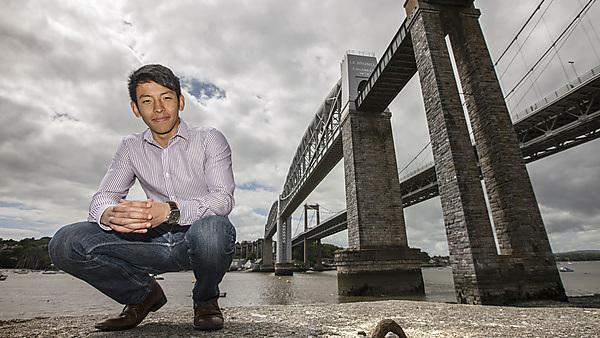 And it’s here in Plymouth that Ajen has been afforded a remarkable opportunity – to be personally mentored by Lockheed Martin’s former CEO, Stephen Ball. Stephen, a graduate and honorary doctorate from Plymouth, was introduced to Ajen through the Development Office, and the two hit it off immediately. They now have weekly hour-long calls, where Ajen has an opportunity to explore issues around leadership, problem-solving and communication, and gain a remarkable insight into how Stephen would handle different situations. In addition to being mentored by Stephen, Ajen, who was born in Brunei and moved to the UK at the age of five via a spell in Nepal, also received a scholarship of £4,500 to support his studies. With the launch of the Tamar Engineering Fund later this year, supported by Stephen Ball, the University is taking steps to address the acknowledged lack of engineers in the UK. Supported by an official University campaign, orchestrated by the Development Office, it will aim to support and encourage students to enrol on engineering degrees. And what does the future hold for Ajen? After next year’s placement, he’ll return to Plymouth for his final year, before moving on to the master’s degree. Beyond that, it’s a potential chartership, a role in project management, and the chance to leave his own legacy-piece in the world. Ajen is now 21, and he is in the fourth year of his studies as he’s been promoted to the MEng programme. Engineering underpins the very fabric of our country and economy, from our roads and bridges to our buildings and utilities. And yet, in this country, we haven’t valued engineering anywhere near highly enough.